The theological self-destruction of the church never starts with a pastor who doesn't even believe in the existence of God. It begins with denials of one doctrine here, another there. Before long, the unwillingness of the church to call its churches and ministers to account leads to further theological concessions. The cowardice of church bureaucrats opens the door to any and all theological aberrations. The next thing you know, there is an atheist in the pulpit. A church afraid of "a protracted discussion about the meanings of words that in the end will produce little clarity" is itself the guilty party in that lack of clarity. The church bears the responsibility to make the issues clear and to defend the faith -- otherwise it isn't a church at all. The Dutch have become famous worldwide for their liberal approach to assisted suicide and euthanasia. In this case we see something new -- the suicide of a church. Quote taken from: What do you get if you divide science by God? Although the Templeton Prize is said to be awarded for contributions to "affirming life's spiritual dimension", I was still surprised (pleasantly) to see this article run in the BBC. Anecdotal evidence indicates that psychics, astrologers, palm readers, Tarot card shufflers, numerologists and other paranormal specialists have become the rage as investment advisers and brokers appear clueless. Quote taken from The New Atheist Movement is destructive Apparently from reviews, atheists aren't too happy about this article. In addition to encouraging Christians to read this article for information, my desire here is to draw out some points worth noting from one of the paragraphs in the article dealing not so much with the new atheism but with the author's own atheistic beliefs. 1. If there is "no purpose" behind what governs then how can things happen by "historical accident"? Besides, what is the standard to measure if something is an accident? How do we know what is accident and what isn't? If this happened by historical accident what else did and how do we tell? If no purpose, then what matters and why care? 2. No grounds given for the assertion that "there are not two kinds of stuff, the natural and the supernatural, but one." 4. For this atheist, human life boils down to simply the biological. As history of worldviews has shown, this view runs into problems when it comes to experience, human dignity, human consciousness, etc. 5. No grounds noted for assertion that humans do not survive beyond biological death. Amazing. They act as is they believe baptism actually means something. "...Mr Hunt has become the pioneer in a rejuvenated campaign for a way of cancelling baptisms given to children too young to decide for themselves whether they wanted this formal initiation into Christianity. "You can't remove from the record something that actually happened," said the Bishop of Croydon, the Right Reverend Nick Baines." Pastor Mark, I must first profess the high esteem that I have for you, your teaching and your mission. I frequently utilize your videos and books in my classes/courses and feel you are the right man "for such a time as this". A light in the darkness. I praise God for you, your family and your ministry. Christ is honored and God glorified through you and Mars Hill. I have read some of your responses to the recent Time article, particularly how you draw distinctions between the "old" and "new" Calvinism. I tend to agree with the high level summaries you utilized, however I do have some "heartburn" with how you characterized the "new" Calvinist as seemingly 100% continuationist. From the exposure I have had to your theological positions, I believe that you are probably at least partially cessationistic. The reason I believe this is because I, until very recently, would have also characterized myself as a continuationist until I was exposed to a couple of paradigms that made me re-think my alignment to this position. I'd like to present these paradigms, challenge you to consider the implications and present a framework that I pray may be helpful. First, my understanding of the initiation of the gifts of the Holy Spirit was the occurance in the 1st century we Christians refer to as Pentecost. This historic event was captured in Scripture through the guidance of the Holy Spirit by the physician and Christian historian Luke in his 2nd letter to Theophilus that has been named the Acts of the Apostles - commonly called Acts. 26But the Helper, the Holy Spirit, whom the Father will send in my name, he will teach you all things and bring to your remembrance all that I have said to you. 1 - If you believe any of the miraculous spiritual gifts were operative in the apostolic era only, and that some or all of those gifts gradually ceased before the end of the first century, you are a cessationist. 2 - If you believe all the spiritual gifts described in the New Testament have continued unabated, unchanged, and unaltered since the initial outpouring of tongues at Pentecost, you are a continuationist. Now, I am fairly certain that you would agree that at least one activity associated with the initial gifting of the Holy Spirit has ceased - that is - the ability to prophesy Scripture. I also think you'll agree that this gift was only valid during the formation of the New Testament canon, otherwise, the Lord is still delivering Scripture through the Holy Spirit to His people today and the Reformed principle of Sola Scriptura is rendered invalid. As it has been traditionally presented, consistent continuationists believe that the extraordinary gifts should be sought after as an ordinary part of the Christian faith. Whereas the cessationist has no issue with extraordinary occurrences for extraordinary circumstances, the expectation is that the normative exercise of the spiritual gifts will fall in line with the less extraordinary (but not less wonderful!) edification gifts, at least until the final hours of the eschaton. That is, cessationism does not assert that the Holy Spirit has ceased working how and as He desires. Cessationism does, however acknowledge that God does ordain and move in different ways in different times during history and that the end of the Apostolic age heralded the end of the normative and validating acts of extraordinary signs and wonders. Pastor Mark, it is my prayer that this brief letter would give you some food for thought and act as some small aid in your deliberations on this subject. Quote taken from here in an article entitled "The Humanitarian Impulse: Not “God’s Work” for this Veteran." Often, unbelievers ask the question "What about the person who participates in good works though he doesn't believe in God?" 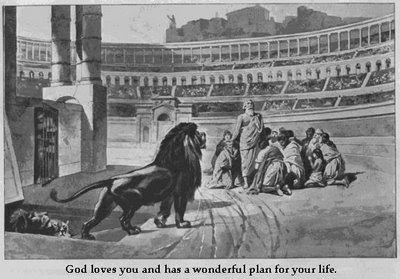 This true life illustration highlights how individuals and their works (apart from consideration of faith and motive) may APPEAR pleasing, righteous and good; but when viewed in whole not only show how the individual would FALL SHORT of meeting God's righteous standard but would BE OFFENSIVE to (and condemnable before) God! After observing and collecting data, you form a hypothesis that fits the available facts. Then you come up with experiments, or you propose other ways of confirming the hypothesis with data currently not available. Once the hypothesis has been shown to predict outcomes or new evidence, it becomes a theory. Then you write a scientific paper documenting the evidence and making your best argument according to the scientific method. Then you submit the paper for publication and peer review. Skeptics will pick it apart, but if there is real substance, some legitimate scientists will adopt the theory. When looking at people playing golf, I saw that some were good players and others were hacks (like me). After spending many hours watching golf live and on TV, I saw that all golfers had something in common. Once I saw it, it became so obvious what it was. If one looks for it, you can't miss it. The one common thing I saw was that the good players had a certain element in their swing that the hacks didn't. From this simple observation I concluded that this part of the swing was the most important aspect in being a good, par-breaking golfer. This swing method is based on this observable fact, and if hacks could learn it, they would become much better golfers. The next thing was to test my idea by teaching it to some golfers to see if it worked. It did, and a few people were very happy about improving their game so much. I then documented and video'd this swing element and how to teach it, and sent it to Golf Digest. The editors were very impressed and published my article and linked the videos from their website. Their expert columnists agreed that it was a good article to publish, and a good discovery about improving people's golf. After publishing, the letters started pouring in, and although some were a bit critical of my teaching methods, the results overall were excellent. I was now a Golfologist. Had to post this here as well. One of the reasons why it is important for us to establish global partnerships is because of what we in the West need to receive, and not just because of what we have to give. And one of the things we have to receive is the courage and conviction of faithful, orthodox believers in other parts of the world. I concur wholeheartedly with Dr. Ryken's comment, taken from here. Believers today need to be intentional about keeping and establishing global relationships in the interests of the kingdom. The coming evangelical collapse is an article worth the read, though one must keep in mind differences between expressions and movements associated with the Christian faith and the faith itself. Reminds us that our ultimate hope is not in the things of this world, but in Christ, who not only brings redemption but will bring restoration, and who though he calls us to faithful service in this world and also tests us, even bringing about division and events of raising up and bringing down, that progression will continue to come, all the while with doing so in a manner that his kingdom presence, objectives, manifestations and fruit continue to remain, occur, and advance. With this in mind, it's a read that gives good food for thought and consideration on a variety of issues. If it is true that "religion ... evolved along with other belief and social cognitive abilities", then why do evolutionists fight so hard against it? 3. a greater purity to the visible church as false professors separate themselves from the church. A scenario came up in a discussion board I frequent concerning a biology teacher that would challenge his students whenever the topic of evolution arose. He would challenge the students that if they objected to his veiws they should speak up and that their silence was basically an acceptance of evolutionary theory. I'd probably start with the fact that evolution is not intellectually satisfying on its face in that the theory relies on the unguided increase of information to accomplish what it theorizes, which is counter to the observation of natural processes. I'd also say that I object to the premise of evolution, that is, "from goo to you" as well as the implications - that is - social Darwinism (Nazi-ism, Communism, the French reign of Terror - more deaths in the last century - over 100 million or so - than the sum of all previous religious or political movements in human history). I'd summarize that while I may not be able to rebut the teacher on the level of detail into which they may try to dive and while evolutionary theory and the worldview it supports may be intellectually satisfying to some, I am satisfied that my worldview supports a spiritual and scientific framework with an ultimate purpose and goal for Creation and does not reduce Mankind to a morally deluded, purposeless gene-passing meatbag. Many states adopted abstinence-only education in return for federal funding, but 13 years after Congress designed the programs in 1996, teen pregnancy rates are on the rise and critics say kids are simply not listening to the abstinence-only message. "It's bad — we have the ninth-highest pregnancy rate in the country and it's clear that our students need more information," said Emily Pelino, education director for the Adolescent Pregnancy Prevention Campaign of North Carolina (APPCNC). A good example to remind the church that while it's nice when the schools reinforce what is taught in the church, the church cannot and should not look to the world to carry forth it's mission. It shouldn't surprise us at times when teaching abstinence only education in schools apart from the foundations of righteousness, of honoring God, of accountability along with the reality of new life in Christ and power through his Spirit that pregnancy rates may go up. The problem is not just students needing "more information", for contraceptives and the like will only mask the sin and curtail some of the outward physical consequences, but not solve either the root issues or problems. This path of alternating secular education can continue in a pendulum effect forever, and while the world may continue on it's path and go it's own ways, let the church be light and a voice of truth leading to holiness, happiness and God honoring living and lifestyles for those who will hear and overcome. Praise be to God for his truth and for the promise and power that comes through his Son, the risen Lord!